Casey Stoner admitted his surprise blunder in a thrilling Qatar MotoGP race was a ‘silly mistake’ as the Aussie crashed out of the lead to hand Valentino Rossi a 104th career success. 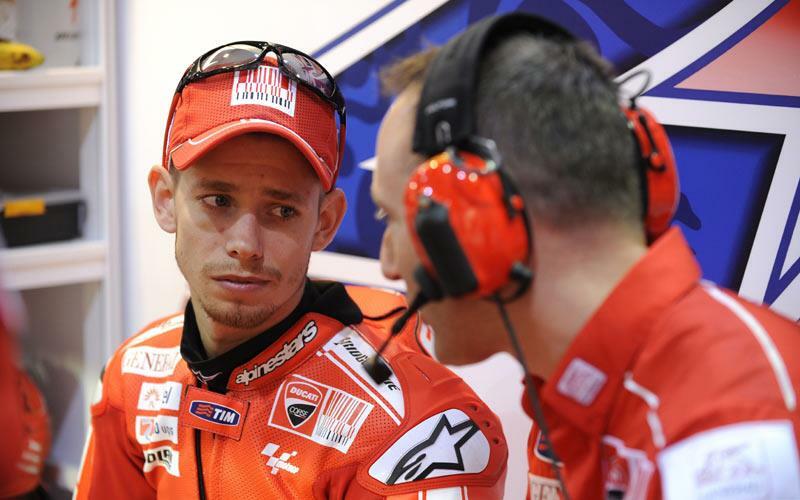 Stoner looked on course for a fourth successive victory at the Losail International Circuit in Doha when he lost the front of his factory Ducati GP10 on lap six. The 2007 world champion, who had claimed pole position for the 19th time in MotoGP, had just increased his advantage over Fiat Yamaha rival Rossi when he lost control at Turn Four. The 24-year-old was able to walk away from the spill but was unable to rejoin the race with his bike too badly damaged to continue. With the red-hot favourite watching the rest of the 22-lap race on the TV, Stoner could only ponder what might have been as Rossi held off a determined challenge from Andrea Dovizioso and Nicky Hayden before heading home Jorge Lorenzo for a Fiat Yamaha 1-2. Stoner could at least take some comfort from seeing Hayden performing so strongly at the front of the field. Stoner has been something of a one-man band for Ducati since 2007, but American Hayden produced his best ever Desmosedici ride to finish fourth. Hayden just missed the podium and Stoner said he was delighted to see the former world champion in contention.